Chain is an essential part of a motorcycle and keeping it clean and lubricated ensures that you have a trouble free smooth ride, at the same time it helps increase the life of the chain as well. 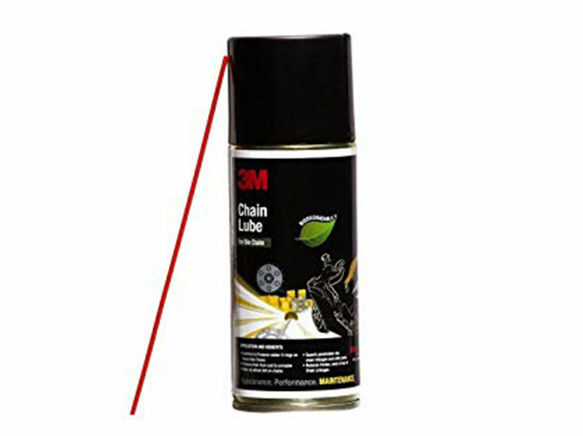 3M chain lube provides internal and external lubrication for roller chains in motor cycles, forklifts etc., especially for chains operation in dusty/dirty atmosphere. It has excellent water repellent properties and thus provides efficient lubrication for chains operating in water, sea or steam. For effective lubrication, clean the chain thoroughly, completely remove old lubricant residues. After cleaning spray the product while rotating the chain in the event of new chains, all anti corrosion coatings must be removed.